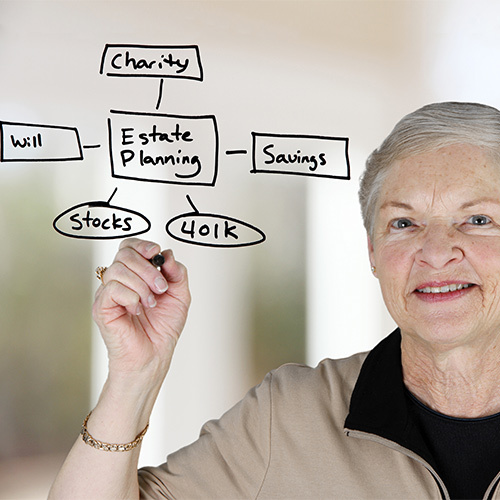 People can set goals at any age, even in their senior years. The elderly can create vision boards, which are visual representations of goals and involve putting up images and inspiring words on them. A vision board can be an effective tool your loved one can use to motivate him or herself to achieve these goals. Harrisburg senior care professionals recommend your loved one use images and ideas promoting a healthy lifestyle on a vision board. A photo of another senior riding a bike, enjoying yoga or swimming lessons, or walking through the park should appear at the top of your loved one’s vision board. Remaining physically active is a goal that benefits seniors in a variety of ways, such as building muscle strength and enhancing balance. A vision board allows your loved one to set exercise-related goals he or she can fulfill and reduce the risk of falls and injuries. Placing a variety of activities on the vision board can help your loved one focus on his or her goals and intentions for the year, which could include learning to play an instrument, getting help using the computer, joining a social media website, or playing brain-stimulating games and activities. Putting a quill on the board or a photo of a pen and typewriter could remind your loved one to begin writing a novel or memoir this year. Brain stimulating activities and games can help your loved one preserve his or her memory and prevent or slow the progression of dementia and Alzheimer’s. Eating healthy is important for seniors because a good diet could prevent diabetes, a condition affecting seniors more than any other age group. Your loved one can maintain a healthy weight by eating a diet full of fruits, vegetables, proteins, and lean meats. Your loved one’s vision board should include pictures of healthy foods or words like “diet” or “healthy eating.” A picture of a garden could symbolize fruits and vegetables. Eating healthy should be a yearly goal for your loved one. Your loved one can add the names of people from his or her social network to the board or put photos of the places he or she likes to visit with friends, including favorite restaurants, museums, parks, and shopping malls. This section of the vision board can remind your loved one of family and friends he or she can call and connect with. It is important for your loved one to maintain a social network to prevent isolation, which can cause depression and anxiety. Seniors need to see their doctors on a regular basis and follow their treatment plans correctly. Your loved one can put pictures of doctors, medications, a clock, calendar, and medical facilities on the board, then add medical symbols and words to complete this section of the vision board. Regular visits to a doctor can lead to screenings to prevent vision impairment, immune system complications, and a variety of age-related diseases. This part of the vision board reminds your loved one of his or her medical responsibilities. Setting goals for a healthy lifestyle and adding them to a vision board can motivate your loved one to adopt healthy habits. If your loved one needs help maintaining healthy habits, reach out to Home Care Assistance. We provide hourly and live-in caregivers Harrisburg seniors can rely on. Our professional caregivers can assist your loved one with exercise, prepare nutritious meals, provide transportation to medical appointments, and help with a wide array of household tasks. For more information on our senior care options, call a Care Manager at (717) 540-4663.